PATTERN STUDY #2 by Stacey Bowers, dedicated to the Blackearth Percussion Group, was written in 1976. The score is a set of several melodic patterns, to be played in any order, repeated as often as desired, and used as a basis for improvisation. The form emerges from the resultant improvisation. PREMONITIONS of CHRISTOPHER COLUMBUS by James DeMars was premiered by Zeitgeist at the Walker Art Center in Minneapolis in October of 1979. This recording uses five musicians playing alto saxophone, two pianos, tablas, marimba, cymbals, and a tam tam. The form is similar to that of the Moroccan “nuba” tradition, in which a pulse gradually emerges to support melodic material. The eclectic blend of idioms and sonorities produces a paradoxical “state of being” as each gesture draws forward. SET SAIL FOR THE SUN by Karlheinz Stockhausen is from the set Aus den Sieben Tagen, written in May of 1968 in California. It is realized from verbal instructions rather than a traditional notation. 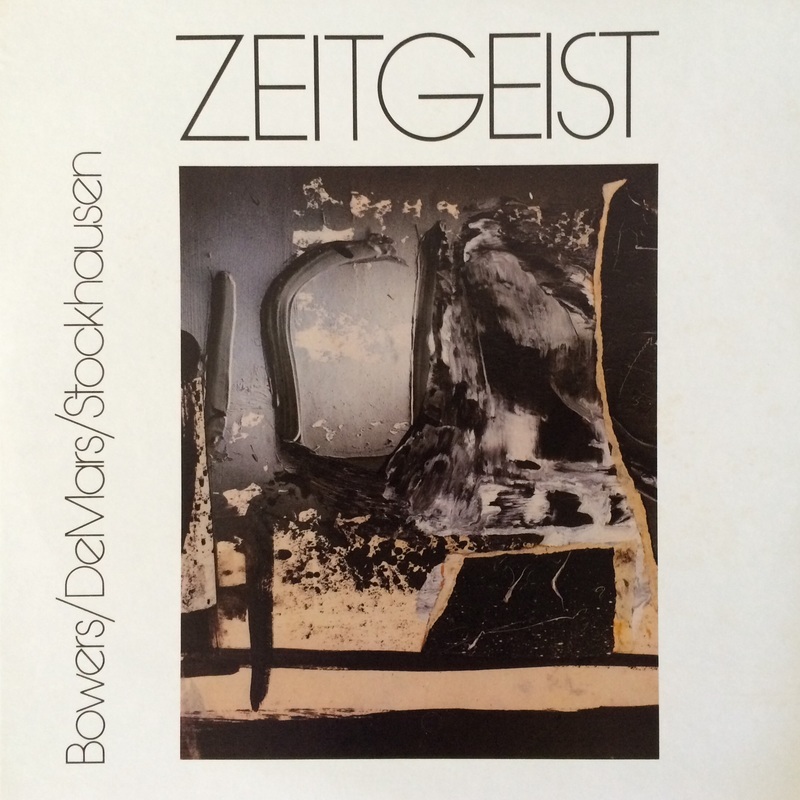 ZEITGEIST was formed in 1977 to discover and realize in a musical language the concepts and perceptions of ourselves and our contemporaries. We work together to increase our vocabulary in order to express ideas in many varied forms. We wish to thank Russ Borud for his patience and the strength of his alliance beyond the call of duty. Ensembles that perform DeMars' music include the New York Choral Society, Brooklyn Philharmonic, Mormon Tabernacle Choir, Utah Symphony, Philadelphia Orchestra, Buffalo Philharmonic, Phoenix Symphony, California Symphony, Chicago Sinfonietta, Tucson Symphony, Anchorage Symphony, Choer et Orchestre Francais D'Oratorio (Paris), Wuppertal (Germany) Orchestra. As a conductor, DeMars' performances include the national premiere of his work, An American Requiem, at the Kennedy Center in Washington and nationally televised performances at Cathedral of St. John the Divine in New York. In 1998 he conducted the European premiere of the requiem in Paris at Église La Trinité with Choer et Orchestre Francais D'Oratorio and was inducted to the French Order of Arts and Letters. With Native American flutist R. Carlos Nakai he has created four CDs for Canyon Records. Two World Concerto received two Native American Music Awards and led to the 2008 release of DeMars' inter-cultural opera, GUADALUPE. In 2010 he received the Arizona Artist of the Year Governor's Award. Aesthetic influences include the writings of Joseph Campbell and Albert Camus. He holds a doctorate from the University of Minnesota and currently teaches composition at Arizona State University in Tempe. Karlheinz Stockhausen (1928–2007) started composing in the early 1950s. Already the first compositions of "Point Music" such as KREUZSPIEL (CROSS-PLAY) in 1951, SPIEL (PLAY) for orchestra in 1952, and KONTRA-PUNKTE (COUNTER-POINTS) in 1952/53, brought Stockhausen international fame. Fundamental achievements in music since 1950 are indelibly imprinted through his compositions: The "Serial Music", the "Point Music", the "Electronic Music", the "New Percussion Music", the "Variable Music", the "New Piano Music", the "Space Music", "Statistical Music", "Aleatoric Music", "Live Electronic Music"; new syntheses of "Music and Speech", of a "Musical Theatre", of a "Ritual Music", "Scenic Music"; the "Group Composition", polyphonic "Process Composition", " Moment Composition", "Formula Composition" to "Multi-Formula Composition"; the integration of "found objects" (national anthems, folklore of all countries, short-wave events, "sound scenes", etc.) into a "World Music" and a "Universal Music"; the synthesis of European, African, Latin American and Asian music into a "Telemusic"; the vertical " Octophonic Music". Stockhausen's entire oeuvre can be classified as "Spiritual Music"; this becomes more and more evident not only in the compositions with spiritual texts, but also in the other works of "Overtone Music", "Intuitive Music", "Mantric Music", reaching "Cosmic Music" such as STIMMUNG (TUNING), AUS DEN SIEBEN TAGEN (FROM THE SEVEN DAYS), MANTRA, STERNKLANG (STAR SOUND), INORI, ATMEN GIBT DAS LEBEN(BREATHING GIVES LIFE), SIRIUS, LICHT (LIGHT), KLANG (SOUND). From 1977 to 2003 he composed the cycle of operas LICHT (LIGHT), The Seven Days of the Week, which comprises about 29 hours of music. All of the seven parts of this music-theatre work have had their staged world premières: DONNERSTAG (THURSDAY) in 1981, SAMSTAG (SATURDAY) in 1984, and MONTAG(MONDAY) in 1988, all three produced by the Teatro alla Scala in Milan; DIENSTAG (TUESDAY) in 1993 andFREITAG (FRIDAY) in 1996, both at the Leipzig Opera, SONNTAG (SUNDAY) in 2011, at the Cologne Opera. With MITTWOCH (WEDNESDAY), the Birmingham Opera Company presented the last day of the LICHTheptalogy on Wednesday, August 22nd 2012. After LICHT, Stockhausen intended to compose the hours of the day, the minute and the second. He began the cycle KLANG (SOUND), The 24 Hours of the Day, and until his death in December 2007, he composed the 1st Hour HIMMELFAHRT (ASCENSION) to the 21st Hour PARADIES (PARADISE). Lee Humphries is president of ThinkingApplied.com, Minneapolis, MN. He works in a variety of fields inventing algorithms, analytical techniques, and problem solving strategies. He was originally educated as musician and holds undergraduate and graduate degrees in music theory from Indiana University. In the 1970s, he taught form and analysis at the University of Minnesota and co-authored a textbook on the development of musical perception. He left academia in 1977. For the next decade he conducted new music for the Minnesota Composers Forum (now the American Composers Forum) and other professional ensembles. Concurrently he studied mathematics, economics, information processing, linguistics, and general systems theory. His musical swan song was a video marionette opera—a satirical comedy about robots and artificial intelligence that he produced under the auspices of the National Endowment for the Arts. In 1984, he steered himself into the sciences and founded a small interdisciplinary think tank. He began to devise conceptual frameworks, models, and mathematical procedures applicable to investment finance, inventory management, bank analysis, musical learning, and planning theory. Each project resulted in a practical solution to some problem that he had encountered in the real world. They all reflect his lifelong interest is the sequence of mental images that guide specific expert behaviors. Thomas Lawrence Toscano (BME University of Denver, MM New England Conservatory, MM Yale University) has been an internationally active orchestral/opera conductor since 1979. He spent the early years of his career as a singer, playing diverse roles and performing innumerable premieres, including performances with Zeitgeist at Carnegie Hall. He began his "serious" composing in 1996, with Dear Mama, and later that year Summer's Dream. His most relevant compositions include La Dolente Via/Tutto Passa, and Messaggio e Domanda. September 2007 saw the creation of a new performing organization. OperaOGGINY, a new performing opportunity for young professional singers. 2008-2010 saw 9 productions with OperaOGGINY, the discovery of Williamsburg's Lost Theater, McCaddin Memorial Theater and it's ressurrection.